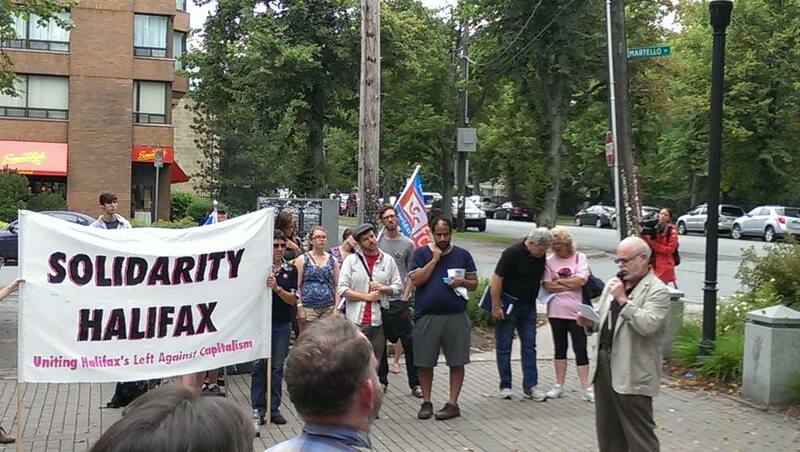 Speaking on behalf of Solidarity Halifax, Professor Larry Haiven addressed the amassed crowd during the Halifax Labour Day celebrations. Not so long ago I saw a report from a union organizer in the United States. He said when he goes to parties and people ask him what he does for a living he says he’s a “workers’ rights advocate.” And everybody says “Isn’t that great.” But then he tells them he’s a union organizer and they immediately disapprove. Let’s hope for the day when we don’t have to apologize for being trade unionists. Solidarity Halifax is a membership-based, pluralist, anti-capitalist organization. We do student organizing, worker and trade union issues, anti-racism, alternative economic development and diversity. Our recent campaign “Power to the People” exposed the folly of a former government selling off the power utility to a private company, guaranteeing its profits and leaving us with usurious rates. This October 4th and 5th, we’re putting on a People’s History Conference to remember and celebrate the struggles of Nova Scotians. Brothers and sisters, the past 15 years have not been kind to workers. Even before the economic crisis, average REAL weekly earnings of Nova Scotians actually declined while economic prosperity and productivity gains went almost entirely to owners of capital; this has worsened since 2008. Even unionized workers have done no better than the whole, often accepting settlements worse than the cost of living. Every concession, every accommodation, digs us deeper into the hole. The largest & strongest unionized workplaces i.e. Coal, steel, and manufacturing have disappeared or had their guts ripped out by de-industrialization. There’s been a metastatic growth of temporary foreign workers, now numbering more than the immigrants we really need. Paid 15% less than the going rate, the temporary foreign workers are found in workplaces all over Nova Scotia, further depressing everyone’s wages. And Nova Scotia has long had among worst labour & employment laws in the country. Let’s look at Labour Standards. Some groups are still excluded, especially the dependent and subordinate self-employed including many artists & cultural workers. You still have to work 48 hours a week before overtime kicks in; we still have only 6 statutory holidays compared to 10 in some provinces; vacation time is still among the lowest in Canada and enforcement of standards is still sparse and weak. Collective bargaining law is still in the dark ages. In 1984 We were the first province to kill card count for union certification, and that’s still the case; the corrupt Michelin Act, enacted at the behest of a single employer threw roadblocks in organizing manufacturing workplaces and it’s still around; at same time, unions still must organize and negotiate for small workplaces unit by unit; employers are still allowed to hire scabs during strikes; and the chancellor of Saint Mary’s University, a New York banker, publicly muses about bringing right to work legislation to Nova Scotia; we know the federal government has brutally weakened the right to strike, but is Nova Scotia different, looking at the recent outlawing of a strike by paramedics with the worst kind of arbitration foisted upon them; and every modest attempt to improve employment legislation still spurs a vicious and hysterical employer lobby, echoed by the Progressive Conservatives. We need a workers action centre & workers help line supported by the labour movement, similar to other provinces and the US, that would show that unions are not only for 28% of the workforce working under collective agreements, but for everyone; these would help publicize, popularize and enforce the rights that exist; they’d lead the fight for the most vulnerable workers- agricultural, migrant, dependent self-employed; and they’d help workers join unions where possible. We need greatly improved labour standards, including these that exist in other provinces: bringing back the 40-hour workweek (what a revolutionary idea! ); a higher minimum wage that’s 70% of the median and no “training” rate 50¢ less; ensuring tips belong to restaurant workers & are NOT taken by employers; a minimum 3 weeks paid vacation after 1 year; 9 statutory holidays; equal pay for work of equal value for all; better parental & other leave; protection of whistle-blowers; banning psychological harassment on the job, and more and better enforcement. I repeat that other provinces have these; why can’t we? We need improvements in collective bargaining law, such as: upholding the sanctity of the right to strike without excuses and exceptions; extension of collective bargaining to the dependent self-employed, including artists and cultural workers; certification of unions where 50% +1 of workers sign cards; anti-scab legislation; union successor rights for contracted out workers; and opening negotiations in the case of serious technological change. We also need trade unions that: don’t back away from a fight; speak truth to power; support other trade unions in their struggle; help the unorganized and the unemployed; work with communities, justice-seeking organizations and the most vulnerable in society, and unions that are in the forefront of the struggle for human rights and dignity for all. CAN WE DO THIS, SISTERS AND BROTHERS? CAN WE DO THIS? YES WE CAN.